I haven't blogged since Monday! Which was Halloween and my mom's birthday. I am going to make her lemon cupcakes next week because each week I am so busy! Like today, I baby sit twice! And I have homework, and it's just ahhhh! But I woke up early today so I could blog to my beloved viewers and keep my passion for blogging in gear. So... I had a big Honors Biology test on Wednesday, I did pretty good on it.... but I'm going to retake it because I'm not very happy with my grade... I have improved since last test, but I want to improve more! So I will retake the test on the 14th of November. Tuesday night, while I was studying, I texted my dad (who was still working) and I asked him if he could bring home some chamomile tea, and he said sure. So, he brought it home, and that night, to help me fall asleep, I drank the tea and it put me out like a light. I had such a great sleep on Tuesday night! Also this week... in my Theatre 3-4 class, it has been a lazy week. The opening of Barlow's fall show was yesterday, and of course my theatre teacher was stressed... not really stressed, just a lot to get done. So the kids who weren't in the play (The Merry Wives Of Windsor), we painted sets, and folded programs, made signs and posters, but on Thursday, we folded the programs and finished watching one of my favorite Broadway productions! 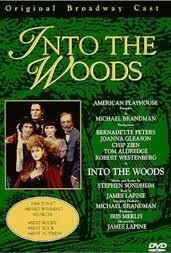 Into The Woods (AMAZON) With Bernadette Peters as the witch. I saw this last year, and I loved it! I seriously want to own this. Great actors and very funny! "SO BIG!" Oh jeez... It's such a laugh. I couldn't find a bigger picture :( But this is what the cover looks like. 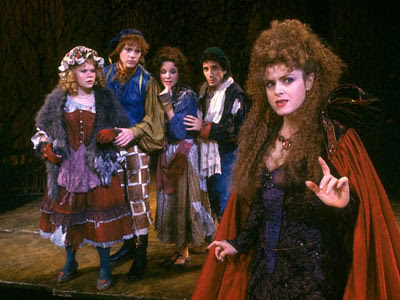 Here is a scene from the play... the play was done in 1987 on Broadway, and as you know, Bernadette Peters was on Annie with Carol Burnett.